NTA GPAT Answer Key, Raise Objections 2019 & Question Papers, Respnonses at ntagpat.nic.in: The National Testing Agency (NTA) has released the Graduate Pharmacy Aptitude Test (GPAT) 2019 answer key. The examination was held on January 28. 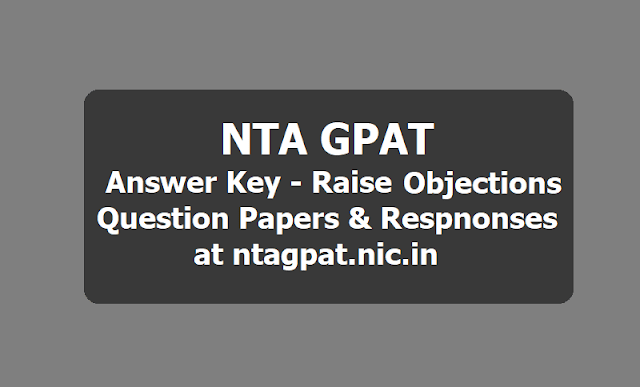 Candidates who appeared for the examination can check the GPAT 2019 answer key from the official website ntagpat.nic.in. They can also check their question paper and responses on the website. The GPAT 2019 examination was conducted in 84 Cities in 24 States/UTs for which 42,827 candidates were registered. How to Check the GPAT 2019 Question paper and Responses and Answer key? Step 1: Visit the official website ntagpat.nic.in. Step 3: Enter the required details on the login page that opens. Step 4: View the question paper and your responses and take a printout. This facility will remain available upto 11am on February 3. Candidates are advised to save their question papers and responses for future reference and for challenging answer keys. 4) Candidates need to pay Rs 1000 as fee for each question challenged. The fee can be paid only through Debit/Credit Card/ Net Banking. The fee will be refunded if the challenge is found correct. Any objection raised after 11am on February 3 will not be considered. GPAT is entrance test for admission to M Pharma or its equivalent courses across India. GPAT is accepted by all AICTE approved institutions, universities and colleges. Candidates must apply separately to the desired GPAT - 2019 participating institutes with the GPAT Score 2019. Then, each participating institute will release their respective cut –off GPAT Score which candidates should meet to get qualified for admission to that particular institute. Candidates are advised to see the details of the admission process of each participating institute of GPAT - 2019 on their respective website. Note: The result of GPAT 2019 will be declared by February 8, 2019. GPAT score will be accepted by around 800 participating pharmacy institutes.